If you have Portfolio level expenses or transactions that cover more than one Property, you may want to "Split" them for better reporting. Navigate to your Transactions page and click the checkbox to the left of the transaction in question. You'll see three new blue buttons appear at the upper right of your screen: Edit, Split, and Delete. Click the one labeled "Split" and then enter details for each resulting transaction. If you need to split it more than two ways, click "Add Split." Use the "Split Even" button to spread the transaction amount evenly amongst however many child transactions you've generated. Click "Save" and you should see your new transactions in the ledger. You can then recategorize and associate them with specific Properties as desired. 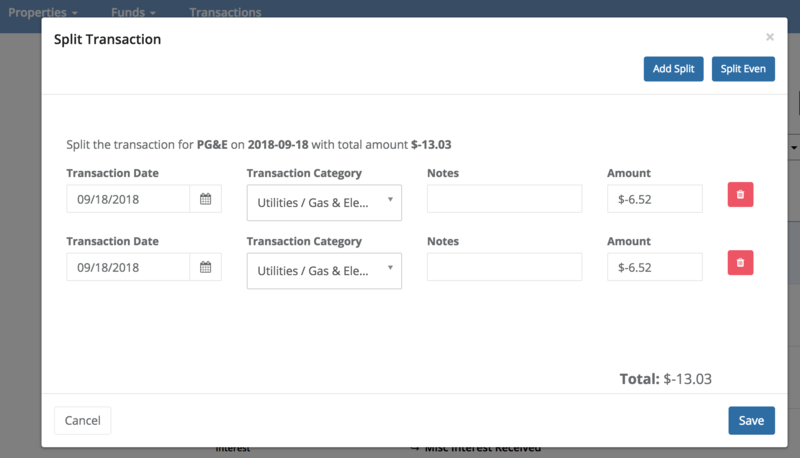 If you've completed a split in error or just want to clean things up a bit by merging two or more transactions, start by clicking the checkboxes to the left of the transactions in question. You'll see that once you click more than one checkbox, the "Split" button becomes "Merge." Click the "Merge" button and then enter final details for the one transaction that will survive. What Types of Transactions Should I Split? Splitting transactions can be a really effective way to fairly allocate costs to various Properties in a larger Portfolio. You might have a single insurance policy covering multiple addresses or a mortgage that's secured by more than one property. In these instances, splitting transactions and assigning the correct amount to each property is a critical step in generating reliable financial reports. The particular methodology you use to allocate income and expenses over multiple properties is up to you. Some investors allocate according to square footage ratios, while others use relative valuations or acquisition costs. The most important aspect is that you stay consistent over time so that you can accurately compare results from month to month and year to year. Other types of transactions you might want to split if you have more than one property include common overhead items like mileage and travel expenses, CPA fees, and office supplies. Still Having Trouble With Splits or Merges?